If you enjoy going to Greyhounds Reach the Beach at Dewey Beach, Delaware each year in the fall, you will also enjoy Spring Dewey! 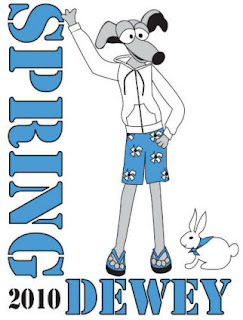 It’s Springtime for Greyhounds in Dewey Beach again – join us for Spring Dewey VI April 9-11, 2010. Spring Dewey is small and friendly and almost free and ocean-breezy and the weather was beautiful for 2009, so join a bunch of beautiful greyhounds for a relaxed weekend of uncrowded beaches, low-key activities, and the spectacular Sunday Send-Off Beach Walk and Box Lunch Picnic. Register Now for Spring Dewey 2010. The registration fee lets the sponsors, among other things, book a warm dry location for the Sunday Celebrations (to ensure good weather) and cover expenses. Each person who registers may enter their favorite greyhound-related group in a raffle. All leftover money is donated to the group whose name is drawn at the Sunday Box Lunch. If you have the required Dewey Beach licenses for your dogs, greyt! It’s a lifetime license. If you don’t have Dewey Beach dog licenses, you need to stop by the Dewey Beach Town Hall and get them. BIG NEWS!!! For the first time, FFGR, Inc. will be vending at this greyt event! Jimmy McClellan and George Quinn are going for the weekend and will manning our sales tables. We will be selling all of the usual greyt inventory including greyhound garden statues (always a winner!). Please think about attending this laid back and fiendly event if only for a day. You will not be diappointed. For all the information you need about attending (including registration, motels, signing up for lunches and programs), just click on the title of this news thread.